Hello everyone. 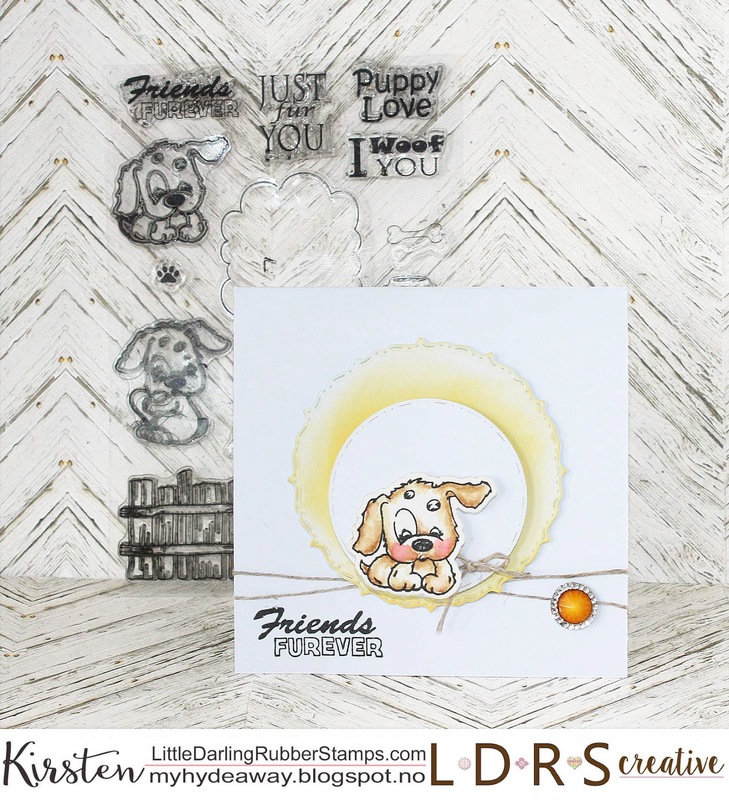 It's Kirsten here today, showing you a CAS card with the supersweet Puppy Love stamp and die set. 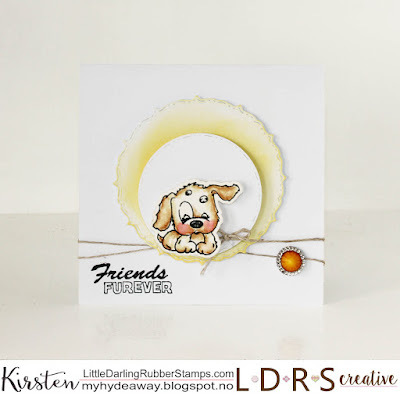 The dog has been coloured with watercolours and dies out with the matching die. 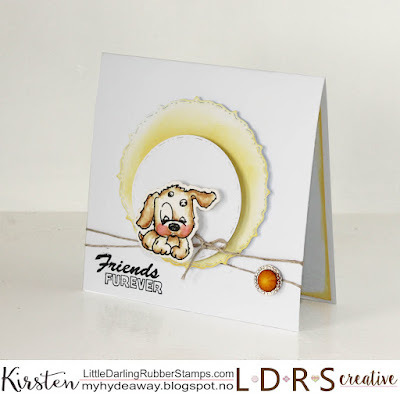 The circles has been cut with dies from the Fancy Circles Dies set. 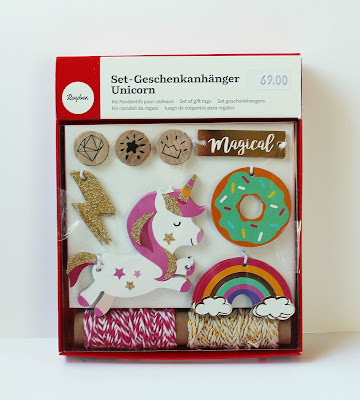 They have been added with 3D sticky tape to create dimension. The yellow colour has been created with ink. 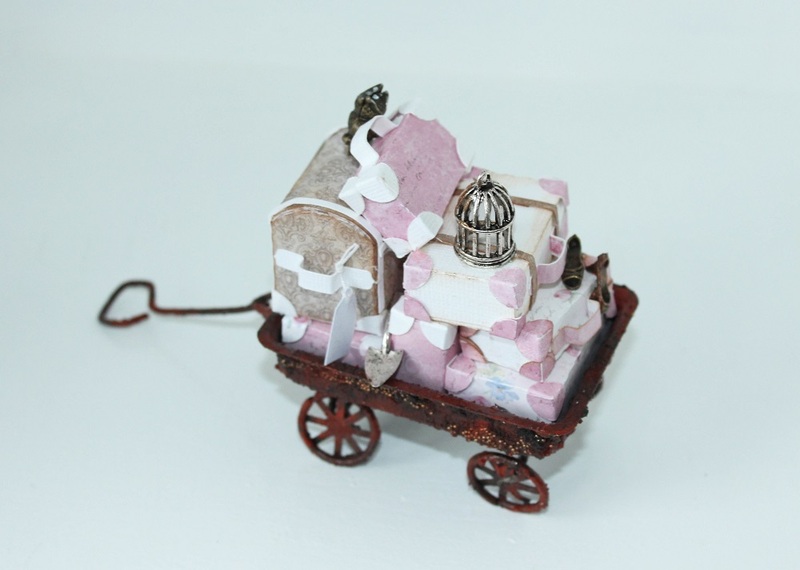 The heart at the back is a die cut created with the heart from the Lovelette die set. 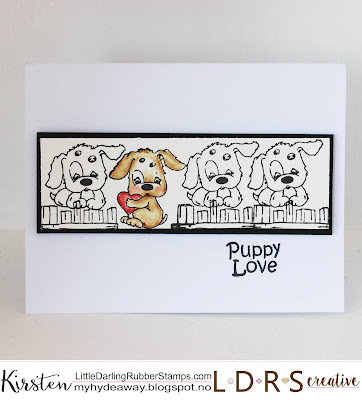 The pattern on the heart has been made, using a die cut from the same stamp set as a stencil. Have you tried the dies sets from LDRS creative? 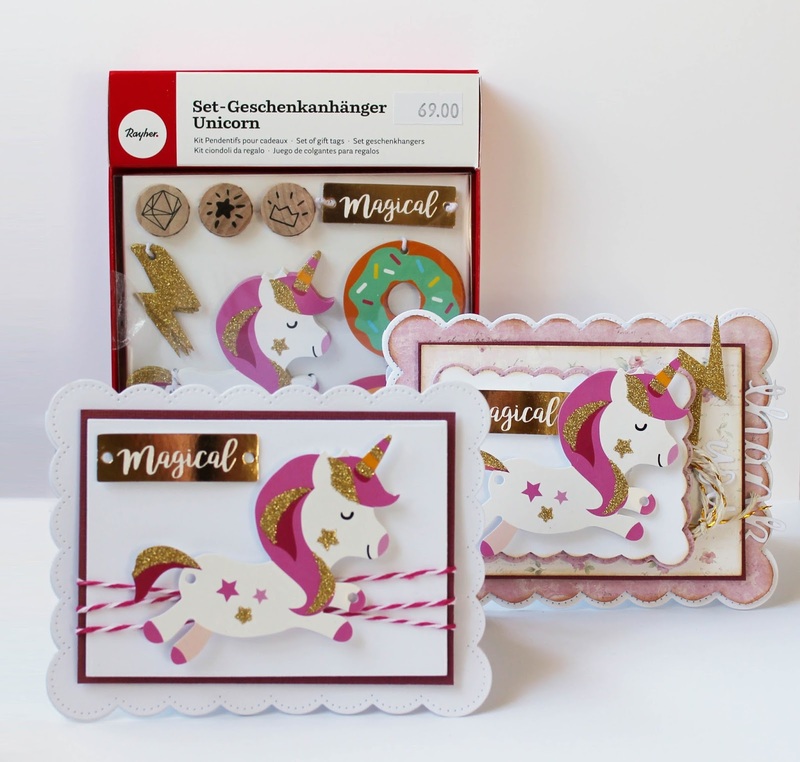 They have fantastic sets with dies that so good in combinations with each other. 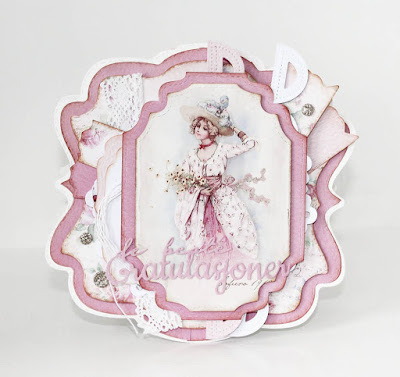 On this card, I have used several LDRS dies sets and Maja design sin Sofiero collection. 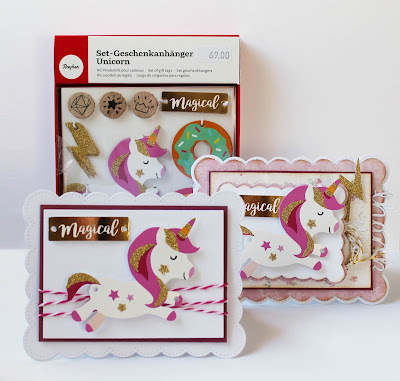 All the die cut texts are from Papirdesign. The motive is from Maja design's Sofiero collection. The motive is from the paper Sofiero - Ephemera. 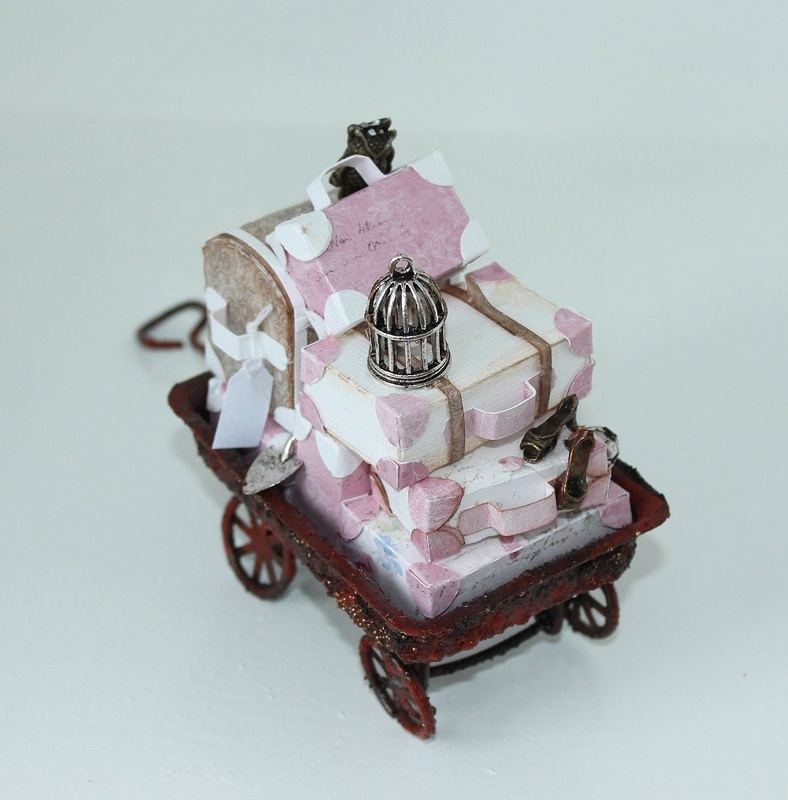 The background paper is from the same colletion and it's called Strolling down the Rose path and - Enjoying the fragrance. 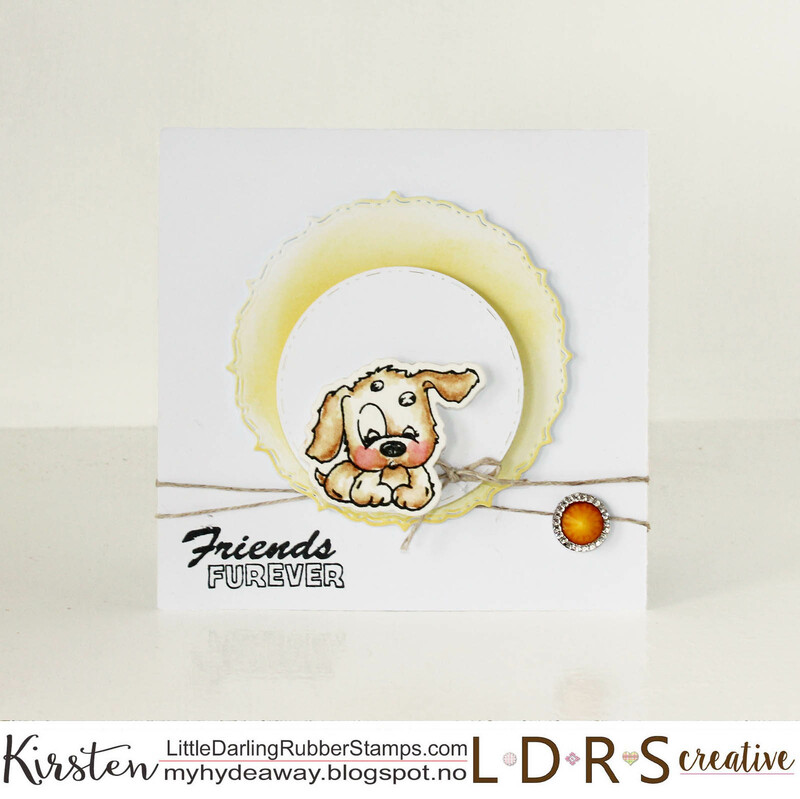 The card itself, had been created using the die set Allifair Build-A-Card dies from LDRS creative. 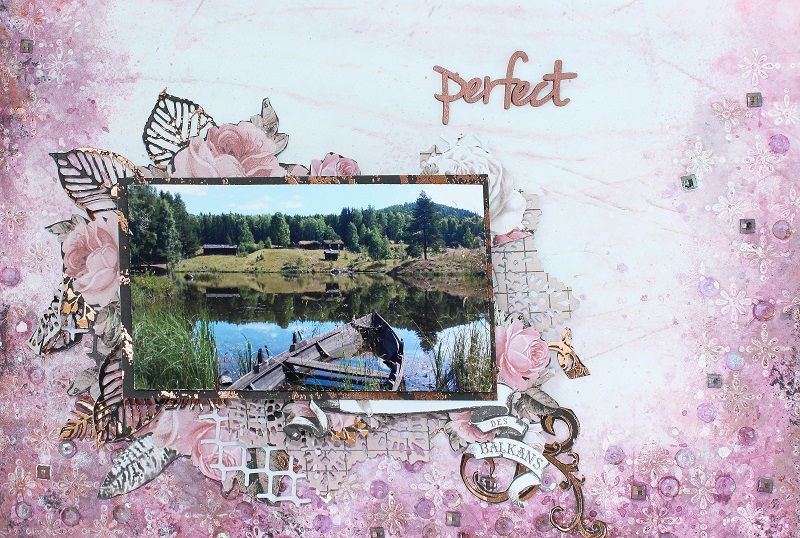 The motive and tags has been ut out with the dies set Fancy Rectangles & Layers Die Set. 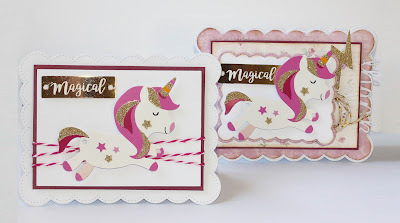 I have also used dies from the dies set LDRS creative - Regal Frame Die Set. 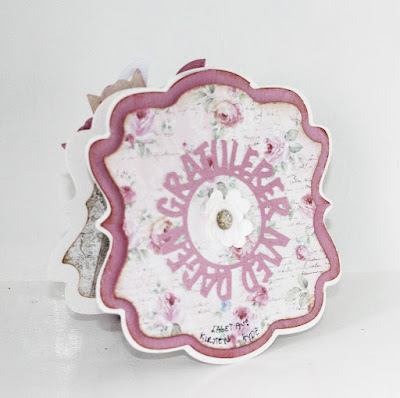 Teksten "De beste gratulasjoner" is a die from Papirdesign. 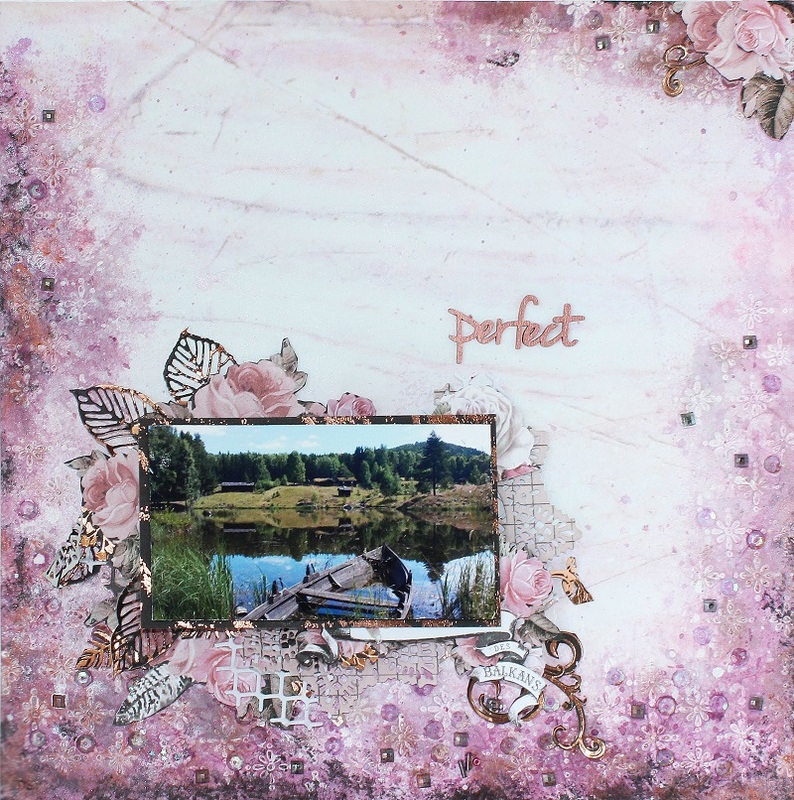 I have used Vintage photo distress ink to distress all the edges. All layers has been glued togehter with 3D foam for the 3d effekt. The inside of the card has been decorated with panels and space for a message. The bavk of the card is simply decorated with an old die from Papirdesign. This layout was created for the magazine The Papercrafting a while back. 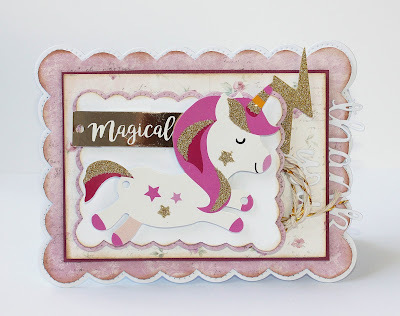 I used Prima's paper Cherry Blossom Garden - Cherry Blossom Gold Foiled as the background paper. The paper was worked with to create more colours and effects at the edges. I added sequinses and square beads at the edges. 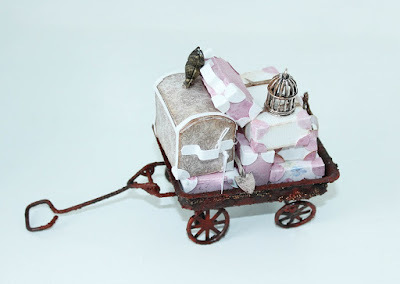 Then I used a stencil with gesso to create some texure. Then I used sprays from 13 arts to add some colour. 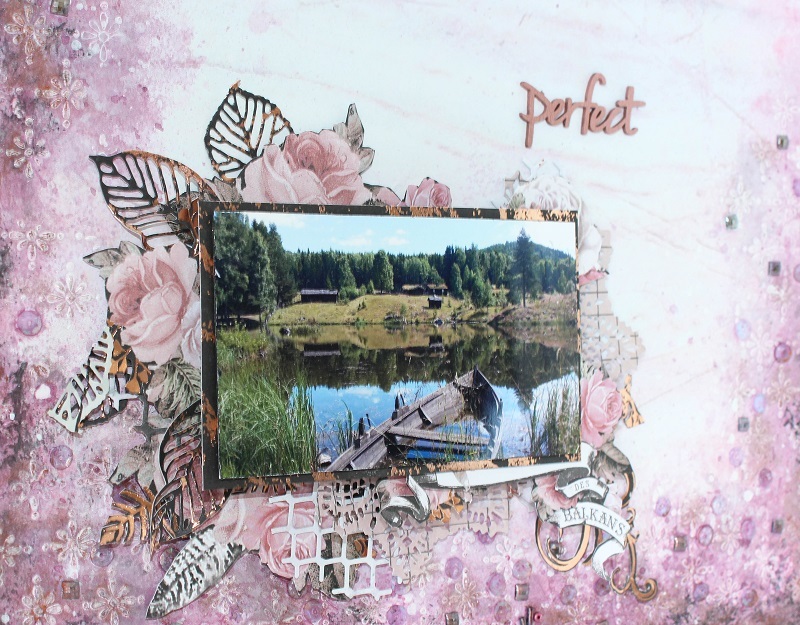 The word "Perfect" is chipboard, and has been spray painted in copper. Leaf dies are old dies fromPrima. 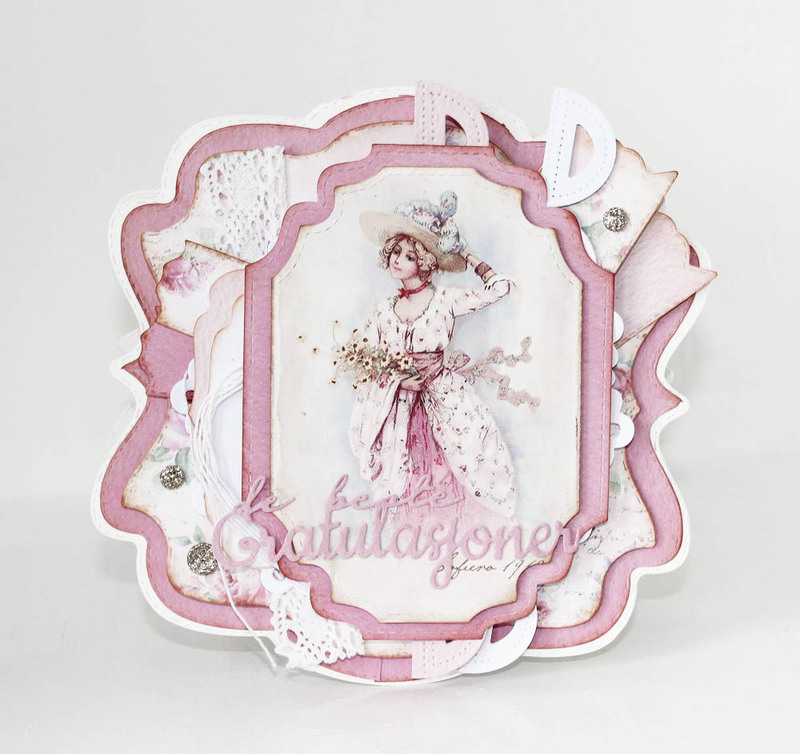 The fishing net die cut has been made with a die from Kaisercraft. 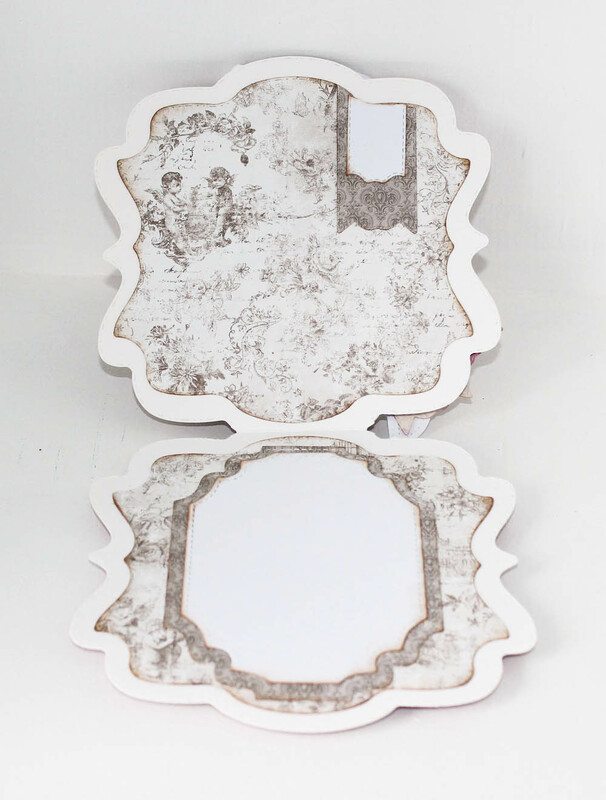 The flowers has been cut from Prima's Amelia Rose - Dark Florals fra Prima. 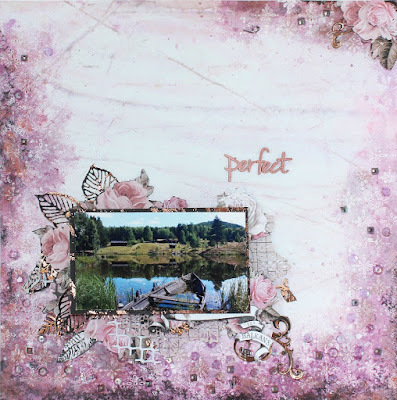 I used 3D tape between the layers to create dimentions. 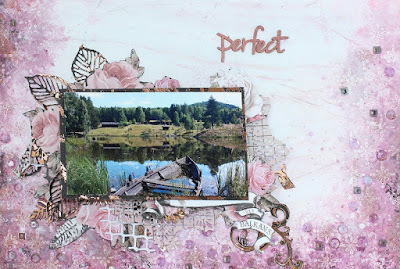 The photo is from Maihaugen in Lillehammer in Norway. 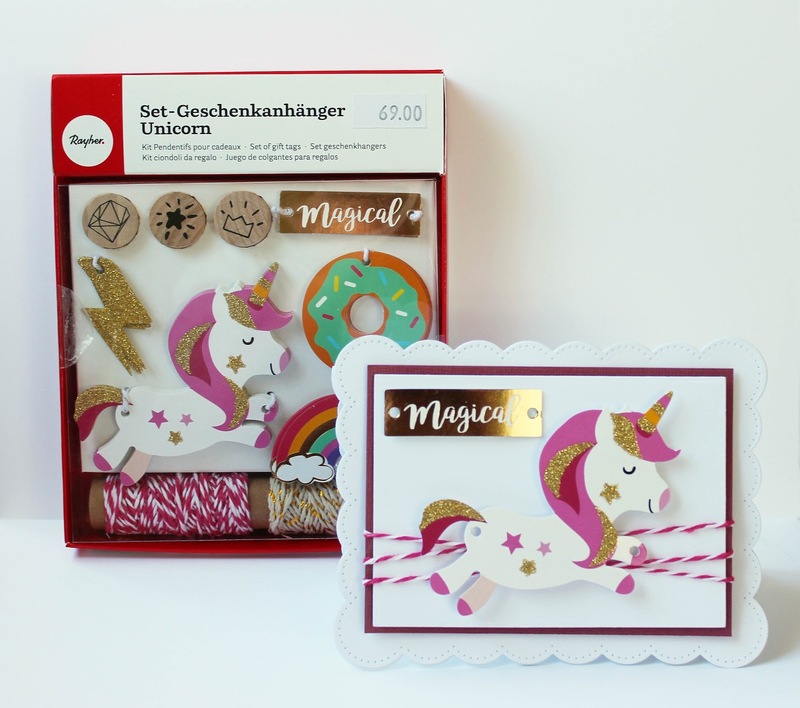 Unicorns has been a trend for some time, and is a large hit with small (and grown up) girls. Here, I have created two unicorn cards in the same style, one CAS and the other with more details in layers. 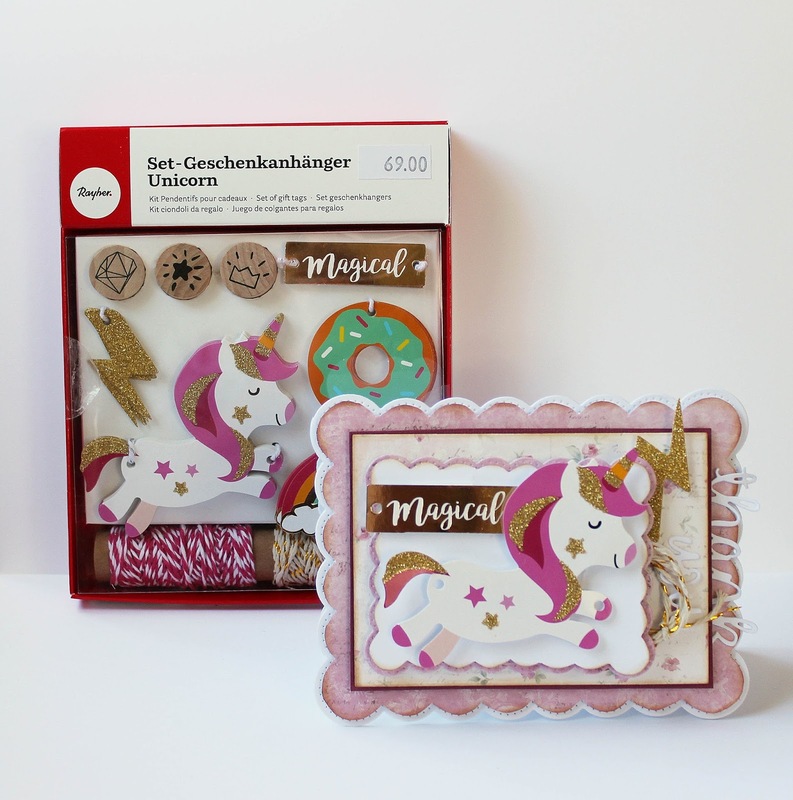 I used the unicorn gift tags and twine set from Rayher. 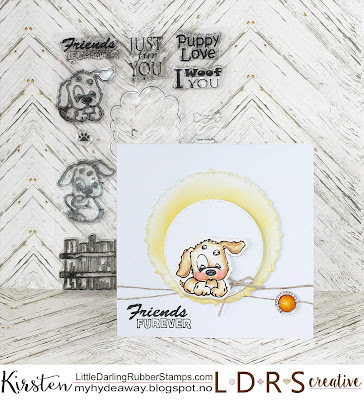 The first card has been made in layer upon layer with diecuts, created with dies from Avery Elle, Large Pierced Scallops - Elle-Ments Dies. Twine, unicorn, golden lighthening and the word "Magical" is from the unicorn gift tags and twine set from Rayher. 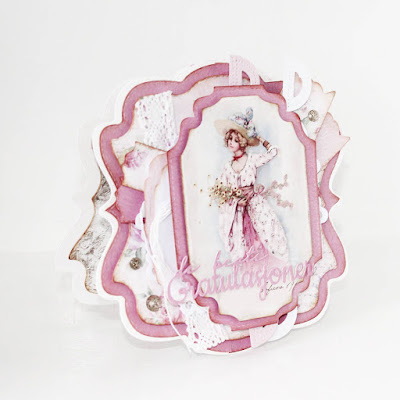 This CAS card has been made with dies froma Avery Elle, Large Pierced Scallops - Elle-Ments Dies. 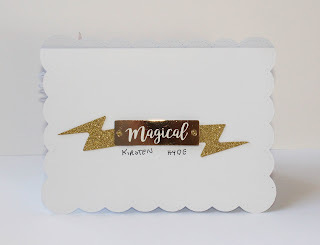 The back of the cards has been simply deoreted with glitter lightnening and the word "magical" from the unicorn gift tags and twine set from Rayher. 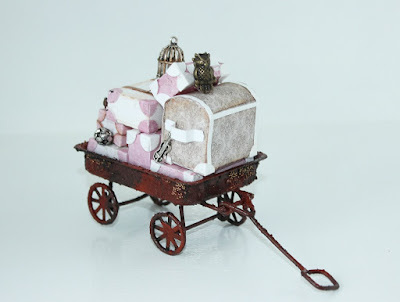 Some time ago, I got a challenge from Hobbykunst to decorate a small trolley. I was asked to make it in a rusty style. 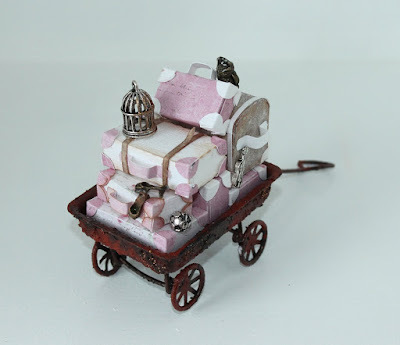 I decided to create a vintage suitcase trolley in Harry Potter style. 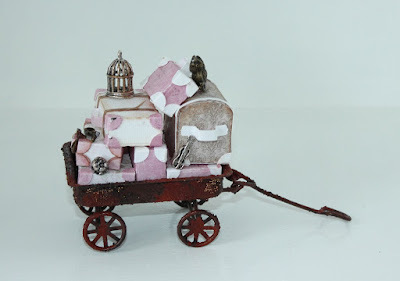 All the suitcases are rather small and they are hand made from papers from Maja design's Sofiero collection. I used the papers Princess Margaretas Garden, Strolling down the Rose path og Enjoying the fragrance together with white Bazzill. 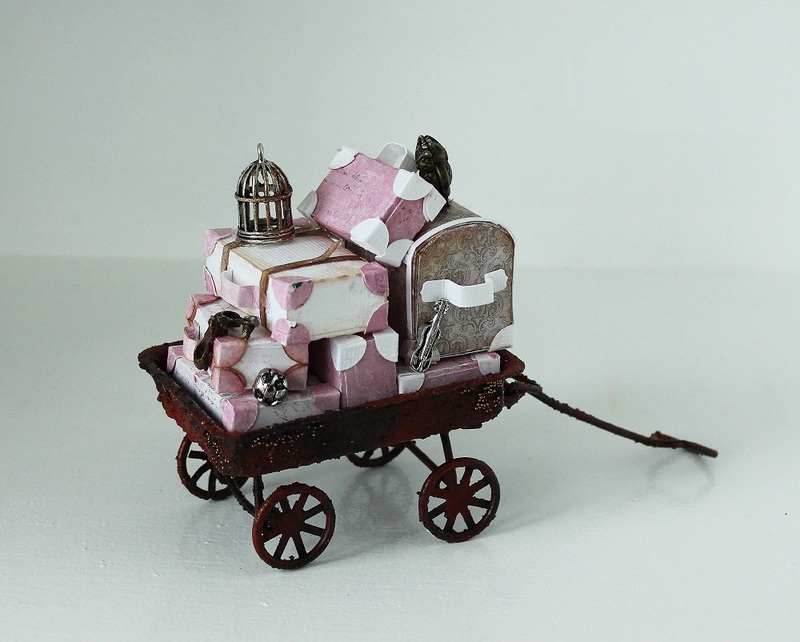 The trolley is a miniature model of a suitcase. I glued on microbeads from Finnabair with Liquitex heavy gel. After this, the trolley has got a few strokes of Folk Art rust paint. The suitcases has been created, making small boxes and adding corners and handles. 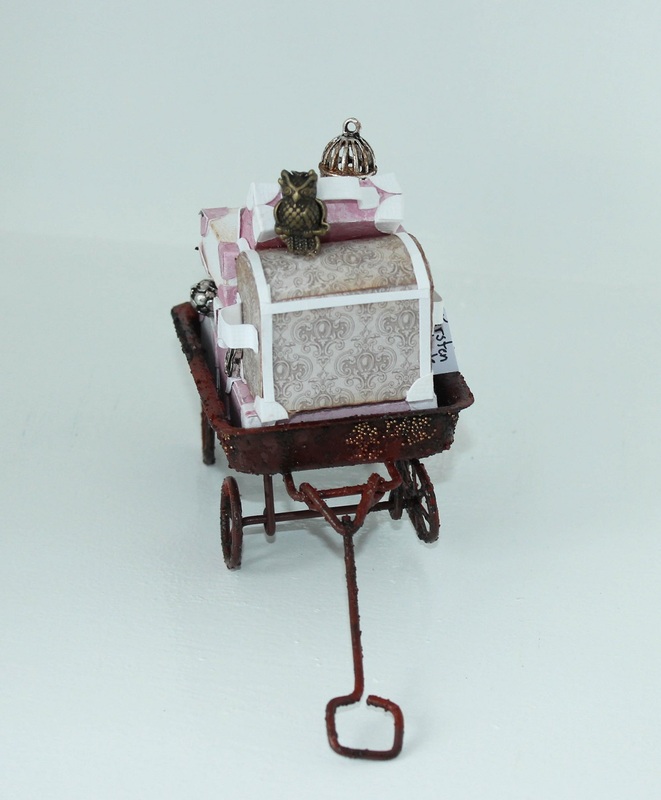 I added different metal charms, a bird huse, shoe, fotball, a spade, a guitar and a little owl. On the little chest at the back, I aslo added a little tag. 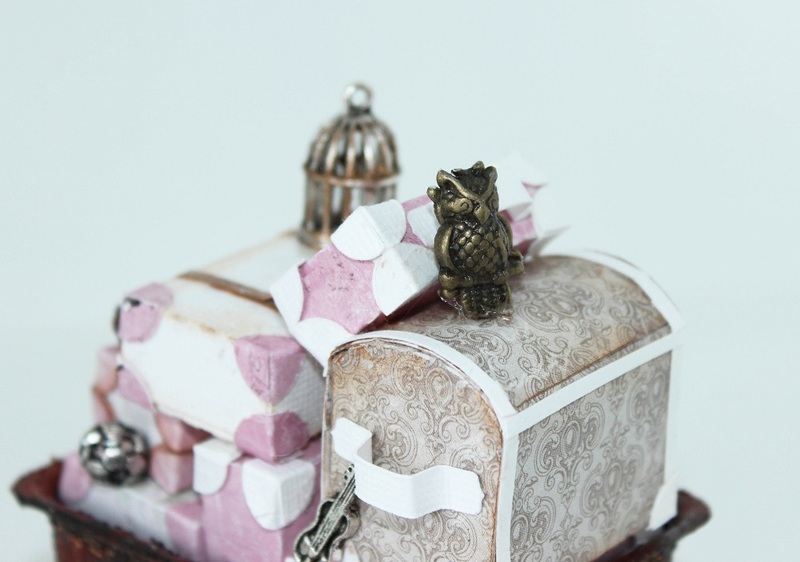 The owl has been created, gluing two owl charms against each other. 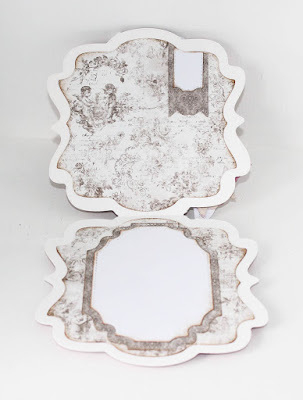 Several of the suitcases has been distressed at the edges with Vintage photo distress ink. 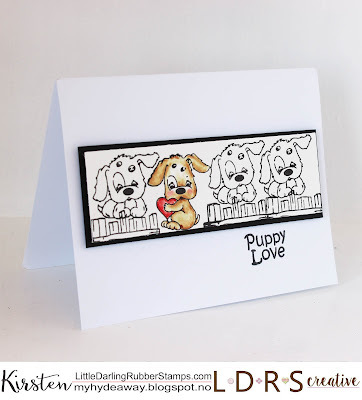 Today, I am showing you a simple CAS card featuring the super sweet Puppy Love stamp set. 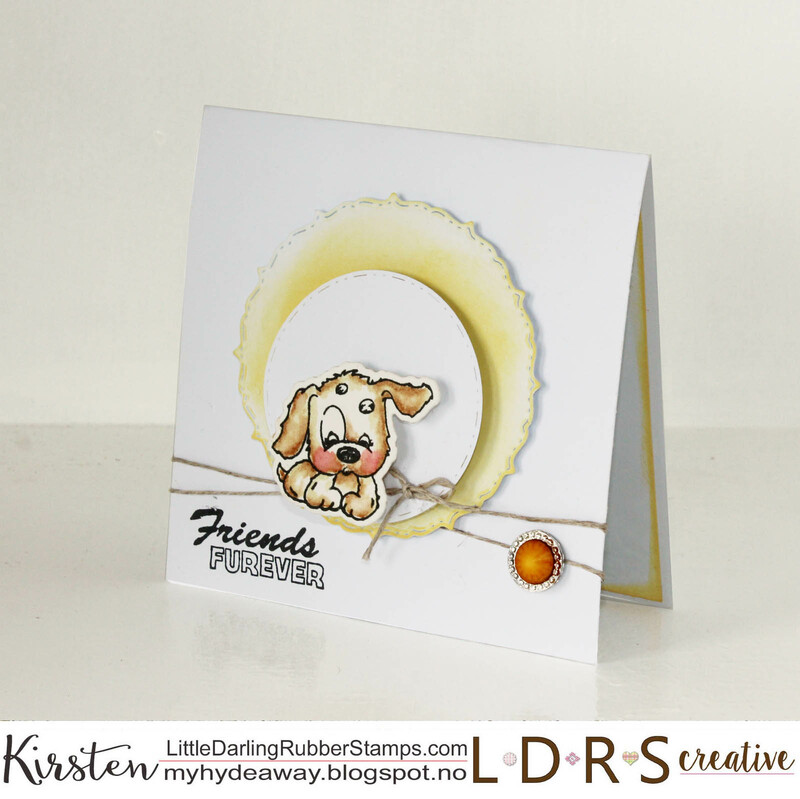 I used the Raven hybrid ink pad for stamping, as this is fantastic to use with watercolors. 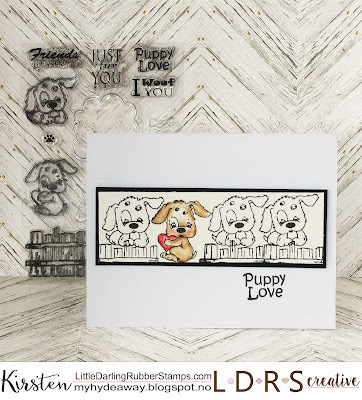 The dogs and the fence has been stamped along the image, with the dog with the heart in between. I only coloured the dog with the heart. I mounted the stamped image on black cardstock, and mounted the black card on the front of the card. 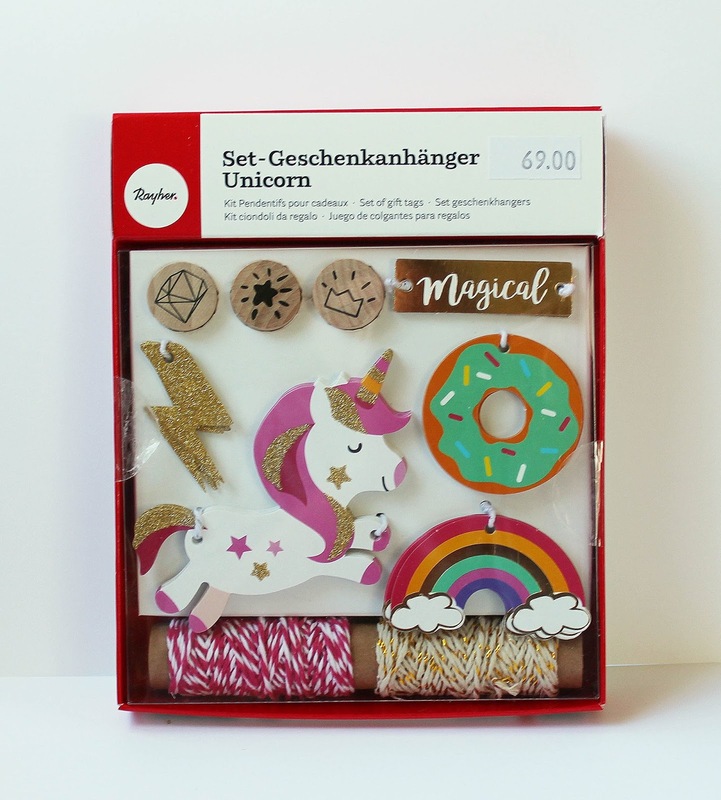 Everyhing has been mounted with 3D foam for the 3D effect. 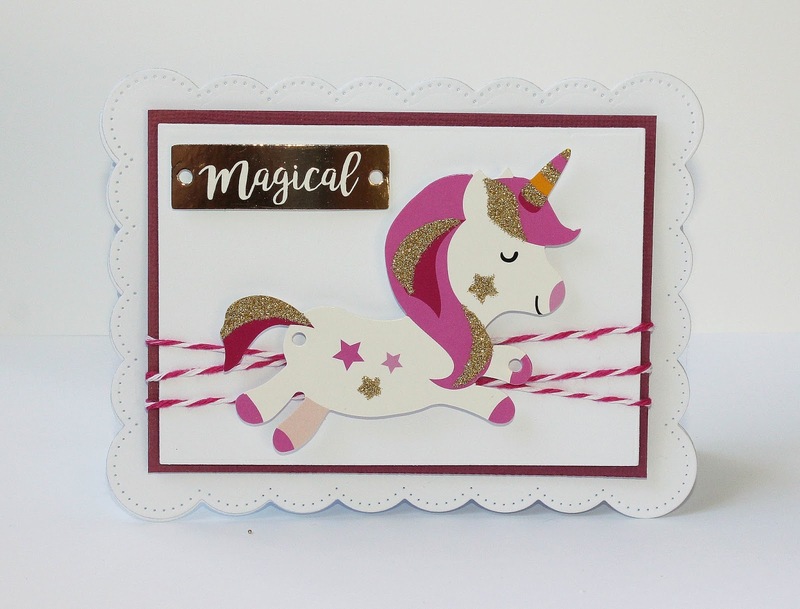 The back of the card is simply decorated with banner diecuts from black cardstock and the Fancy Rectangles & Layers die set. The heart has been cut out using a die from the Lovelette die set using the Sincerely Yours - 6x6 Paper pad.